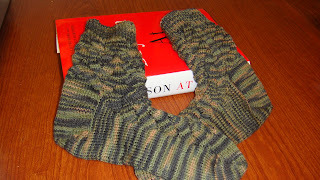 Took yet another pair of "Monkey" socks off the needles again last night. I didn't intend to knit the same pattern twice in a row, but when I pulled out this yarn it fairly screamed "Monkey" at me and I just felt I had no choice. The yarn is from the stash and is one I'd wound awhile back, so although I know it was Cherry Tree Hill SuperSock Merino, the name of the color eludes me. ....and yes I've pictured them against a Bryson book, which I just can't yet bear to take off my desk. I read it, loved it, reviewed it and now don't want to put it away. Must. Read. Again! As a recent "stalker" who thoroughly enjoys your blog, I would love to contact you via email to find out more about your HP and PJ classes! I'm a homeschooling mom of six and my teenagers want me to teach a HP class at our co-op next year. I love your ideas and would prefer not to re-invent the wheel; I'd much rather adapt an existing outline to my students' needs. Feel free to contact me (owen_family@hotmail.com) at your earliest convenience!